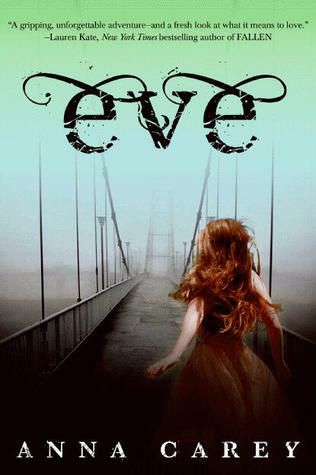 The night before Eve graduates from her all girls high school she discovers everything she has been taught is a lie. Graduates are chained to beds and used like machines to birth babies to make up for all the people that died from the plague. She escapes, meets a hot guy named Caleb in the woods and ends up crashing with him for most of the book. They run from the King and his soldiers in order to keep Eve safe. A large chunk of the population has been wiped out by a deadly virus. The day before Eve is to graduate, another student named Arden tells her that everything they have been taught is a lie. Girls do not graduate and get jobs in their trade; they are taken to another building where they are used indefinitely to birth babies to replenish the population of New America. Arden escapes. That night Eve sneaks out and discovers that Arden was right. When she returns, she is found by Teacher Florence. She does not deny the truth and helps her escape! She tells her how to a find a camp called Califia, where they will protect her. She leaves her friends Pip and Ruby behind. She wakes up in the woods where she hears a group of men. She was taught to fear them so she freaks out and hides in a shack. Over the next several days she sleeps in abandoned houses and cars until she runs into Arden. She agrees to help her get to Califia. They have a run in with a bear and are rescued by a hot boy with a muscular chest covered in mud. The girls go with him. The King’s troops are searching for them, so Caleb helps them hide. Arden gets really sick. They agree to go with him to his camp until they have enough supplies and are well enough to continue traveling. Eve freaks out again about men when they get to the camp, which is inside a mountain. She goes for a walk and Lief (the head honcho) yells at her. The next day she goes hunting with Caleb. Eve starts to chill with the little kids and teach them how to read. Caleb teaches Eve how to swim and also tells her the history of his camp, including the man in charge of the rebels named Moss… things heat up with some hand holding. Later, hunting is good, so they have a little party and acknowledge how great Eve has been with the kids. Eve and Caleb snuggle. The troops are still searching for Eve. Caleb says he’ll protect her. They kiss. She loved it. She loves men now. The girls go on the raid even though it is dangerous because of the troops. Eve implies that she wants to stay long-term with Caleb. He is like.. whaaat? bad idea, way too dangerous. She gets pissed and ends up hanging out with Lief who is kind of drunk. After she goes to bed he sneaks into the room and tries to force himself on her. Caleb busts in and hits Lief, but Lief tells him she wanted him! Caleb buys it and takes off. Lief notifies the troops that Eve is staying at the camp and let’s them take her and Arden. A girl named Lark is already on the truck. The plan is to sell them. They come up with a plan and run off into the woods. A woman named Marjorie shoots the soldier running after them and takes the girls in. Eve makes a mistake and tries to use a code to send a message to Caleb over the radio, but it is intercepted by the King’s troops. They track them down and kill Marjorie, her husband Otis and Lark. DAAANG! Arden and Eve get out of the house, but end up trapped. Arden sacrifices herself by causing a distraction so Eve can get away. Eve isn’t doing so hot, but continues on her way to Califia. Out of the blue she hears a car engine. Woohoo, it’s Caleb to save the day!! He got her message. They bond and tell stories. There is even a snowstorm, so they get to flirt and throw snowballs. They make out a bit. Then they walk right into a trap. There is a struggle with a couple of soldiers, but Eve shoots one of them and they force the other to drive the car. He takes them to the bridge that enters Califia. The crap hits the fan when Eve realizes Caleb can’t go with her. Caleb and Eve walk right into a trap. Two soldiers try to capture them, but Even manages to grab a gun and shoot the soldier holding Caleb. She then forces the other soldier to drive them to Califia. Once they arrive, Caleb explains that he isn’t allowed to go with her. They say goodbye. New America – The term used for the new world that the government is trying to rebuild after a deadly virus wiped out most of the population. City of Sand – The capital of New America, where the King lives.